ZZZZZZ...... I finally caught some Z's the last two days. With school starting, and it being so far away, I spend most of my day driving to and from school or running errands in the other county. I have been getting about 4 to 5 hours of sleep per night. I made that up yesterday, and I will get some more tonight. I also did a little bit of tatting. 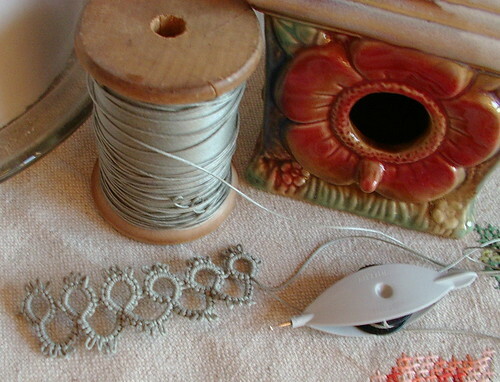 This is copy of a piece of tatted lace I saw at an antique store on Friday. I bought the spool of thread (at the same store). I just love the size of that wood spool of thread. Anyone who knows what size a shuttle is knows that that is very big spool of thread for $3.00, and I decided I would tat the pattern I saw instead of buying the lace. For some reason, I kept making mistakes on my rings and chains; I think it is from lack of sleep. Hopefully, the rest will look much neater. I will add this piece to the 25 motif challenge; this will be item 10 for the challenge. Gosh! you do such wonderful work! I love all the lace that you have made! I need to learn how to tat! you make it look so easy! That is a lovely color of vintage thread.